While it is true that I love Cary and Constance in Topper, Cary’s work alongside Joan is just as delightful. Today, TMP takes a look at Cary and Joan’s two pairings in 1936: Wedding Present and Big Brown Eyes. Ah, newsroom love. Romances between intelligent, sparring journalists have been explored in many films, and more than once in Cary Grant’s filmography. Wedding Present is one example. 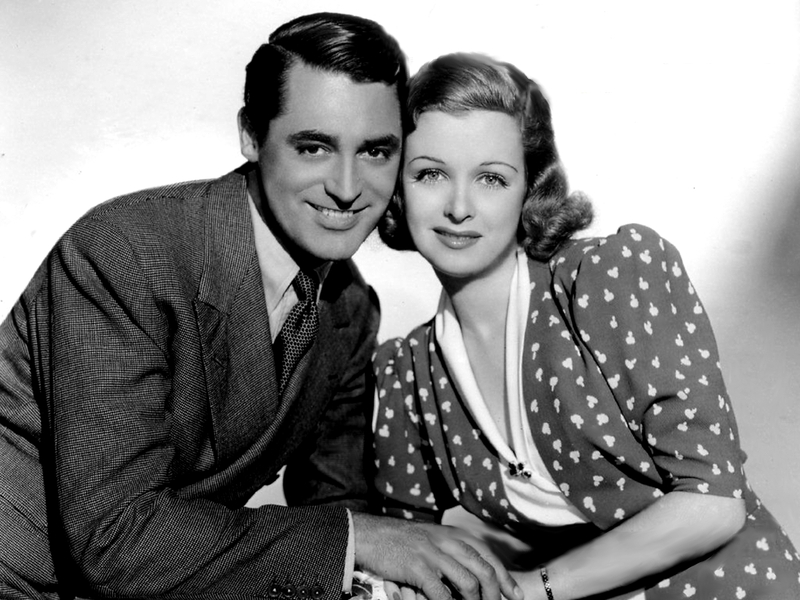 Charlie Mason (Cary Grant) and Rusty Fleming (Joan Bennett) are a pair of rising stars who work for a Chicago tabloid. They’re also very much in looooove. Though they always churn out a fantastic final product, Charlie and Rusty are known for their unprofessional behavior in the process of hunting down those sensational stories. After cracking a particularly grand story involving an archduke, Charlie and Rusty are given journalistic excellence awards. Rusty is given a month of vacation which she uses to visit New York, while Charlie must stay in Chicago because the paper can’t afford to have them both away at once. While Rusty is away, the city editor of the paper quits and the publisher gives his job to Charlie… but Charlie doesn’t quite make an impressive boss, alienating virtually his entire staff due to his workaholic tendencies and pompous attitude. When Rusty returns, she’s disgusted by his behavior and decides to head back to New York, for good. Can Charlie make up for his mistakes and win his lady back? So goes the central dilemma of this Paramount romantic comedy. Wedding Present was directed by Richard Wallace. This film has a completely upbeat mood right from the opening, and two more lovable leads could not have possibly been found to fill the roles of Charlie and Rusty. We all know by now how much I love Cary, and Joan is one of my favorite performers as well. Apart they’re amazing, and together they’re even better. Their chemistry is absolutely fantastic here. The film is generally quite well-written as well. There’s plenty of comedy in the dialogue, and in the scenarios that the characters get themselves stuck in. There’s a nice mix of newsroom drama, subplots of certain articles that Charlie and Rusty are working on, and of course… the romance. I like the fact that the film gives the viewer more to focus on than just whether or not Charlie will win his girl back. We get a good look at their interactions both as a couple and as co-workers, as well as their individual lives. If you’re a fan of Cary Grant, you’ll likely enjoy this film. If you’re a fan of romantic comedy in general you’ll likely enjoy it. There is some typicality to it (you can probably predict the ending before you even begin the film), but this is something that happens across the board with rom-coms and as a result I can’t dock the score for it. I’m a fan of the genre despite its consistently-followed formula, and I enjoyed this flick a lot thanks to its wonderful cast and sense of wit. 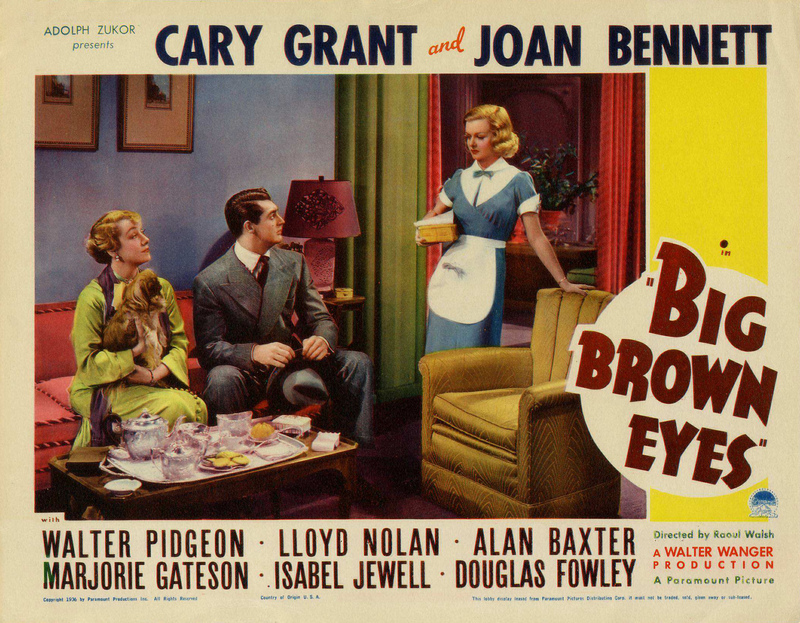 Released in April, about six months before audiences fell in love with the screwball, star reporter team of Grant and Bennett in Wedding Present, the two splendid actors co-starred in Big Brown Eyes. Dan Barr (Cary Grant) is a low-ranking cop who’s hunting down a gang of jewel robbers. 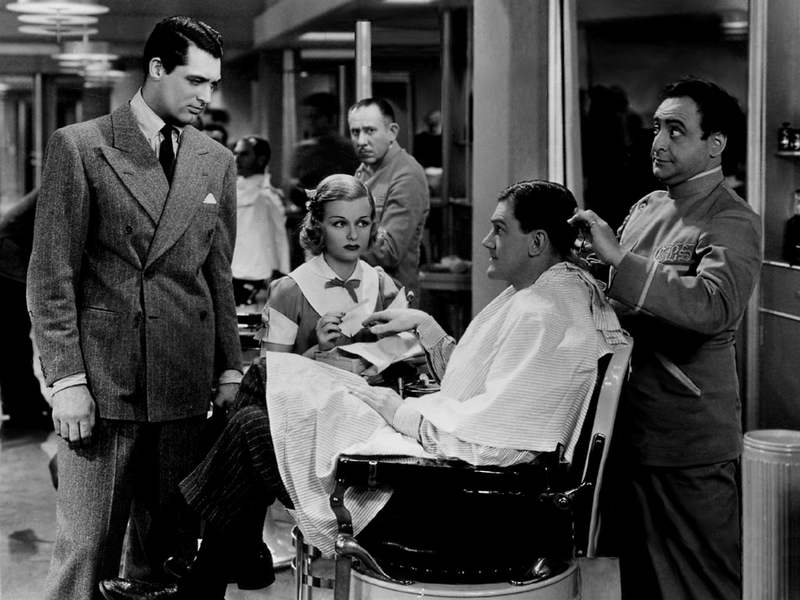 His girlfriend, Eve (Joan Bennett), is a manicurist with an ear for gossip who just may be able to help Dan track down the criminals he’s after. Eve soon finds herself moving on up from manicurist to budding star reporter. Her snooping skills help Dan capture one of the jewel gang members, who accidentally killed a baby during a shootout in a local park. When the case goes to trial, though, the man is set free, leaving Dan disillusioned with the justice system. But with Eve’s sharp ears still at work, the snooping couple just may be able to crack the entire jewel thievery case and break up the crime ring. Raoul Walsh directs Big Brown Eyes. The film is based on the story “Hahsit Babe” by James Edward Grant. The film features an attention-grabbing opening full of beauty shop and barber shop gossip, effectively setting up the premise of jewel thievery and cluing the viewer in to how important Eve will be in solving the case. From then on the film maintains a nice pace. Zippy dialogue makes the film seem even quicker than it actually is. A lot of that zippy dialogue is shared in the verbal sparring between Cary Grant and Joan Bennett as Dan and Eve. Both stars give solid performances and they have incredible chemistry, just as wonderful as it is in Wedding Present. Their banter is a lot of fun to watch, and Joan’s character in particular is incredibly funny. The film’s plot is fairly standard, but the material is elevated by the charming and charismatic stars. The filmmakers seem to have known this and they definitely capitalized on the star quality of the film’s cast, even throwing a nod to Cary’s work in She Done Him Wrong by having Joan repeat Mae West’s famous “Come up and see me sometime” line. The banter-filled romance between Cary and Joan is without a doubt one of the best things about the film, but the criminal aspect of the plot has intrigue as well, and the combination of the two makes the film well worth watching. Unfortunately, these were the only films that Cary and Joan made together. When the year ended, Cary Grant continued being Cary Grant and Joan later turned toward more dramatic roles, with the two never crossing paths on-screen again. Though Big Brown Eyes is similar to Wedding Present in that our two stars appear as a vibrant, witty couple in each film, they are far from carbon copies of each other. It can be difficult for screen teams to differentiate their films from each other when they fall into similar genres (in this case, screwball rom-com and screwball crime comedy), but Grant and Bennett have no trouble giving each film a distinct flair. Their chemistry and performances are very strong in both films, and these two wonderful comedies alone are reason enough for Cary and Joan to be considered a dynamic on-screen duo. 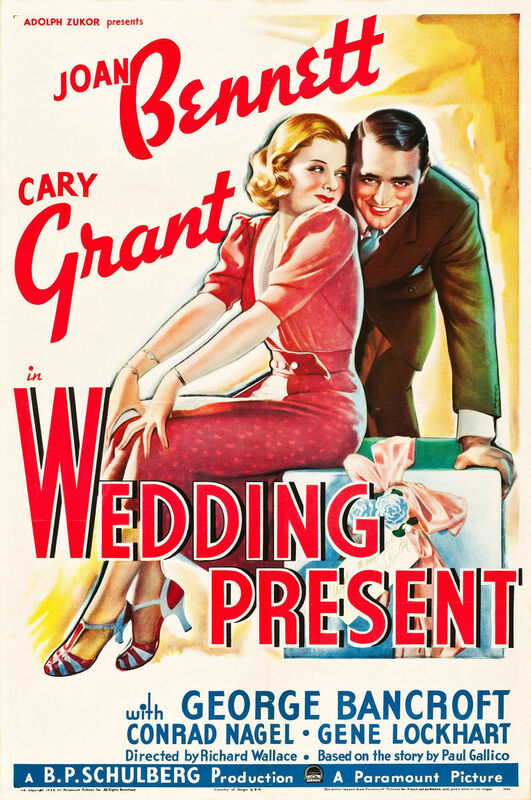 Big Brown Eyes and Wedding Present appear in the Cary Grant Screen Legend Collection DVD set. This post was written for the Dynamic Duos in Classic Film blogathon, hosted by Classic Movie Hub and Once Upon a Screen. Sounds like both these films have some good lines. Plus they both have Cary Grant. How can you go wrong with that! They’re both a lot of fun! As someone who loves old films and is a big fan of Cary Grant (just like everyone else), I am not familiar with these titles. This is unacceptable. Must watch soon! I will check it out! Very behind on my blog reading since I’m on the road this week but I’m glad to hear there’s been lots of Cary Grant. :) Can’t wait to read them all! Two more Cary Grant films I’d never heard of, but both sound like a lot of fun! Although, leave it to 1930s cinema to have a baby killed by gunfire…in a COMEDY! That was definitely an odd, morbid addition to the film! Previous Previous post: Photoplay’s top films on 1954 — How many have you seen?